One step at a time, literally! My mom asked me yesterday if I’ve had much time for reading. Sigh. I wish it was so. I remember the days when reading a good book was a big part of my day. Now it becomes a task I must do, if it’s required reading for my job, or to understand how to do something more effectively. I long for those days of luxuriously slipping in to the pages of a book, painting grand landscapes in my imagination, giving life to the characters of the book, honing in on the details I like to gift them, “she is tall, has lots of freckles, green eyes and jet black hair…he is stooped over in stature, has a piercing dark eyes and uses a cane to walk.” You do that, too, don’t you? Give life to the characters you are reading about? But, I digress…. I also reflected on how much I loved blogging. Once. Many moons ago. I was a consistent blogger. What happened? In the past 3 years here’s a bit of a rundown. I got a new job (which I love and am still there), I broke my foot and had about a year’s worth of recovery, Rob got a new job (which he loves and is still there), we moved….a lot! We packed up everything from 17 years in our house, stored stuff, gave stuff away, trashed stuff and rented our house. We moved downtown to the heart of the city. What an adventure we had! For nearly 14 months, just us two. Walking city blocks, eating all the the things, seeing all the things, enjoying all the things. It was so much fun! But then…we decided to sell our house and figure out what’s next. We worked and worked. Oh, did we work – and so did others we contracted to help. The house was in as tip top shape as we could make it and within 2 days on the market it sold! Bam! AND in the midst of that we offhandedly checked out another house from a family referral and we loved it! But seriously, how in the world could things work out to live there? With lots of prayers and with God’s grace – we made an offer, they accepted and just like that the another new season was upon us. We moved — from the city and 2 bedroom loft with hardly anything but each other and our little Sophie princess dog — to a larger home on acreage and then some, beautifully landscaped (Rob has a riding mower and so far, it’s fun!). And we added in a soon to be HUGE blue tick coonhound named Preacher to the mix just for additional delight! We love our new home. Oh, and in the midst of this my beautiful youngest daughter is getting married in less than a month so we’ve been plowing through weddingness, planning all the things and enjoying the way it is coming all together. I also have high hopes that the bulk of moving and major life changes are behind me…for awhile, as God sees fit. I look forward to reading! I look forward to just sitting and enjoying the gorgeous views from my patio. I look forward to the huge hound dog sitting beside me lazily (well….that isn’t likely to happen until who knows when – he’s a rascally puppy for now), and I look forward to exercising my brain a little more…blogging out some of the pent up creativity that’s been dormant. You may choose to read what I write, or you won’t. You may agree with what I write or you won’t but that’s okay. I just know that writing is cathartic for me. I enjoy it, and I’ve missed it almost as much as reading for fun! Until next time…which hopefully is soon! Posted by cakboliv on June 9, 2017 in "Hmmmm....", Books, Creative, Life, Random Thoughts, Something to think about and tagged Reading. Wart prevention: Soak your hands in STRONG vinegar every day when you’re done playing. Especially because the boys played with nasty toads and frogs that caused warts. Wart cure: Take a kernal of corn off a fresh cob of corn, squeeze the milk of the kernal on the wart, then go outside and bury the corn kernal and your wart will go away. Wart cure: If a kernal of corn isn’t handy, you can also use a dish rag, but it has to be a dirty dishrag, and rub it on your wart, go outside and bury it and then your wart will go away. Rawleigh Antiseptic Salve is recommended for superficial burns, scalds, blisters, boils, bruises, minor cuts and wounds, sunburn, chapped, chafed and irritated skin surfaces. Rawleigh Salve is essentially a drawing salve and is therefore excellent for encouraging stubborn blisters to the surface and extracting dirt painlessly from cuts and abrasions. 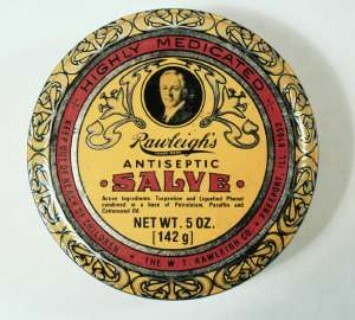 Rawleigh Antiseptic Salve soothes hands that are cracked and neglected or feet that are swollen or sore. Rawleigh Salve represents fantastic value with customers stating their tins had lasted between 3 years and some over 20 years and it still is working as well as the day it was first opened! I’m not sure Mike had the can for 20 years, but it was good to know that if so, it would still work just as well as it did 20 years ago. We talked about cotton strings tied around ankles to ward off leg cramps, mustard poultice placed on your chest for croup or colds, and more. It was awesome. I was so intrigued by the wart conversation, I found this website…and sure enough, the corn kernal and dish rag theory are listed amongst some other very clever ways to remove a wart. So, now you armed with some great options if you are a wart sufferer. Enjoy! Note: What old time remedies have been around for years in your family? Posted by cakboliv on May 13, 2015 in Life. Grab a cup of coffee if you’re interested, otherwise just move along…this post is a tad bit long. 73 days, 21 hours, 33 minutes, 23 seconds, 24. 25, 26, 27….ago, a freakish 30 seconds changed my life drastically. At approximately 6:50 a.m. on a cold, snowy morning, I slipped on an icy sidewalk while walking to my office at work, fell with my foot bent awkwardly underneath me, and broke my foot and compromised the tissue, tendons and ligaments near my toes. I remember thinking, “Wow, this isn’t good,” and then “Get a grip, Carol Ann, you’re tough, just walk it off.” I tried this approach, but soon realized things were just not okay. All these many days later I’ve experienced a season where I’ve learned so much. I now have had my first MRI, my first broken bone, my first hard cast, my first season of having to be waited on hand and foot and foot. This has been tricky for me. I’m a doer. I’m always busy. I much prefer helping others. I am not one to delight in looonnnggg hours of isolation. I…well, you get the picture. Initially I threw quite an internal tantrum. How was I going to manage this? I literally had to have help getting up and down our stairs, in and out of my bed, in and out of the shower (humbling, to say the least), hobbling on crutches when I had to go out to Dr’s appts. All my meals had to be prepared for me (and I love to cook – but cooking with crutches on one foot, it just doesn’t work too well). My wardrobe changed from me caring about every coordinating layer to “what will fit over my cast” which eliminated nearly 80% of my usual options. I was resigned to spandex running capris, yoga pants and t-shirts and sweatshirts. I have about 3 rotating “recovery outfits” that fit the bill with some interesting reclaimed outfits that will suffice if I do have to venture out and about. But, I am learning so much. I’m learning to let others help. To be gracious in accepting gifts. To be willing to (gasp) ask for help when I need it. I’m learning to keep my mouth shut and pray more, to let my attitude and my mind refocus on what is beneficial to others before I open my mouth and let what’s inside venture out. I’m learning to not live in fear of “what if’s” and “what might happen” but instead to accept and be content with what is happening. I am learning that progress is progress, even if it is in the small little flicker of a toe beginning to respond to my glaring at it, willing it to bend, during physical therapy. And, much like many things in life, I’m learning that there is no firm timeline or automatic steps to returning to full function of my foot. And, much like when I was pregnant and wondered what labor would be like…only to have many women share their war stories with me and freak me out completely…the same happens with this injury. “It took me 2 years and 5 surgeries before I walked normal again.” “Well, just know that things will never be the same, I still walk with a limp 10 years later.” The stories pour in from well-meaning folks, even strangers in the supermarket. I smile, and do what my mom always told me to do, respond with, “Oh, thanks so much for sharing that with me.” And then, quickly toss out the negative and hold on to the stories that fill my heart with hope. So, though I wouldn’t wish this on anyone, I’m thankful for the experience that is teaching me so much. I’m learning deeper patience, discipline and the will to choose contentment and joy despite the circumstance. God is gracious. He continues to fill my heart with joy. Now, there have been meltdowns, I mean, I’m as human as the next person. And they haven’t been polite, ladylike meltdowns, but the kind that leave me blithering and slobbering through sobs and wails of despair. Rob and my daughter Elise, who’ve had to provide me with the most care this season, have seen me at my worst…but we shall avoid sharing more about those times. I have hope. I will recover. Even if it takes months, years, to return to normal, or a new normal is created, I will recover. Some don’t get that option, I am grateful. Thanks to all who have shown so much support to me on this journey. One step at a time…literally! Posted by cakboliv on May 11, 2015 in Life. Happy Thursday, people! Sometimes you need to reboot, redefine, recommit. Listened to this song from a few years back by Matthew West on my drive in to work today. It was a good reminder; we all leave some kind of legacy, what kind of legacy will it be for you? for me? Posted by cakboliv on August 28, 2014 in Uncategorized. Life is BIG – Thoughts run your life – Grab some supernatural adrenaline! My Consciousness is how I think about myself. The person we talk to most in our life is ourselves. Usually we are either telling ourselves that we are awesome or that we are awful! If we convince ourselves that we are awesome, then we erroneously believe that we don’t need anyone, including Jesus.If we convince ourselves that we are awful… we wind up at self-pity and believe that no one can love us, including Jesus. The world says, go with your heart. The prophet Jeremiah said that’s a horrible idea. The human heart is the most deceitful of all things, and desperately wicked. Who really knows how bad it is? (Jeremiah 17:9 NLT) If we are honest we know this is true. We rarely desire what is best for us. You tell yourself things that just aren’t true, but you believe them. And a thought doesn’t have to be true to hurt you! You just have to believe it. Your consciousness influences your identity. Be careful what you think, because your thoughts run your life. 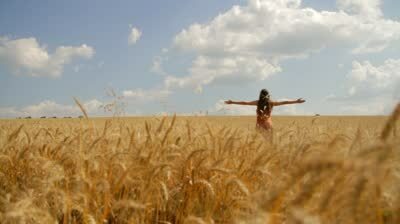 (Proverbs 24:3 NCV) Our self-talk can produce paralyzing fears and deceptive feelings. “I’m afraid to do this,” or “I can’t do this,” then you can’t do that. You say “There’s nothing I can do to change!” Are you sure? You have to challenge your thoughts. You have to challenge your misperceptions constantly or they’re going to dominate your life and send you in the wrong direction. The message inspired me to reflect on the layers of life that I’d been allowing myself to get entangled in. I realized I needed to change my thoughts about certain situations and to instill some check points to make sure I redirected those thoughts when they began to take a twisted turn that led down a path to nowhere productive. I LOVE the verse from Proverbs…it’s so right on – your thoughts do run your life. You can be a good faker on the outside, but truly, what is on the inside can be rotting away and doing so much damage. My goal this week is to be more aware of where I let my thoughts go and to do my best to corral them before they are in full gallop; racing away to who knows where. Posted by cakboliv on June 3, 2014 in Life and tagged Adrenaline, Hope, Sermons, Soul Food, Thoughts. Time Out Dolls, why was that a good idea, again? Grammy? Granny? G-ma? Nana? Nonna? Grams? Journey Into Africa – Ron and Jane Ann's African Adventures!